Where could I find an API to access IMDb data? How do you apply for an IMDb API Key? Is the IMDb API free? IMDb stands for the Internet Movie Database and is a massive online website directory housing tons of information related to films, TV programs, video games, internet streams and more. For each media listing, IMDb also contains data about the relevant cast, directors, producers, plot summaries, trivia, movie quotes, fan reviews, and ratings. Much of IMDb’s data is collected through their users and their user-generated content. 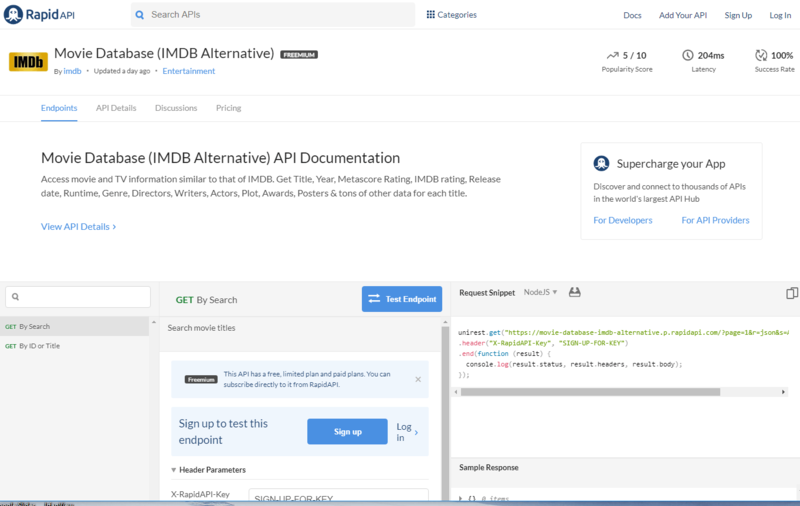 There are many IMDb-alternatives (like TMDb & OMDb) and open movie database app scraping APIs out there that accesses IMDb’s massive database help you gain insight into their data. These APIs and web services are perfect for helping you build the perfect website, mobile application, or software. IMDb does officially have a public API called Search Suggestions, but it is undocumented. The Search Suggestions API has a JSON-P format which cannot be customized. Read more at StackOverflow. You can also try screen scraping the IMDb website for its dataset, but that requires a lot of effort. For a more comprehensive API, check out the Movie Database (IMDb Alternative) Open API on RapidAPI. In this blog post, we’ll cover the API, its endpoints and functionalities. The Movie Database API the perfect solution if you’re a developer in need of an API to retrieve IMDb data. This endpoint will return more detailed results about a specific title you have in mind (IMDb ID or movie title required). Sign up for a RapidAPI user account (it’s free). Navigate to the API pricing page and subscribe to a pricing plan. Hint: There’s a free tier that allows up to 1,000 requests per day. Return to the IMDb API documentation & endpoints page. Pick one of the IMDb API endpoints and select your preferred programming language (method of code) from the dropdown. The IMDb API can be used with Node.js, PHP, Python, Ruby, Objective-C, Java (Android), C# (.NET), and cURL. Fill out all required parameters (and any optional parameters if you like). Click “Test Endpoint” to test the API right in your browser. Copy the “Request Snippet” and integrate right into your website or application. RapidAPI has many SDKs available to help you access the many APIs on the RapidAPI marketplace. Pick any IMDb API endpoint & select “NodeJS” under “Request Snippet”. Read more about the node.js unirest SDK here. Install unirest-php with Composer or from source. Choose any API endpoint and select “PHP” from the drop down to get the request snippet. Select any IMDb API endpoint & select “Python” from the drop down to copy the request snippet. From the IMDb API endpoints page, select “Ruby” from the drop down to get the request snippet. Include the unirest library with or without Maven. Select any API endpoint and choose “Java” from the request snippet drop down to get the request snippet. Requirements: The Unirest-Obj-C client library requires ARC (Automatic Reference Counting) to be enabled in your Xcode project. Download the Objective-C Unirest Library. Get the Objective-C request snippet from any API endpoint. On any IMDb API endpoint, select “.NET” from the drop down to get the request snippet. From an endpoint, select “cURL” from the request snippet dropdown. If you want to learn how to interact with the IMDb API in spreadsheet form, then you might be interested in the RapidAPI Google Sheets plugin. Activate the RapidAPI Google Sheets Add-On. Visit this Google Sheet Template. This is a view-only template, so make a copy by navigating to File > Make a Copy. Now insert your API Key from RapidAPI in the “Insert API Key:” fields. And now you’re all set up! This template has 2 tabs: 1 for Search and 1 for data extraction given an imdbID. Try playing with the “Search Query” and “imdbID” fields to produce different results. Edit the GET parameter for more advanced results. If you have any questions feel free to comment on them in this blog post. After signing up for a free RapidAPI account and subscribing to a pricing plan on the IMDb pricing page (remember, there’s a free version), you’ll be automatically assigned an API key with your application. Yes, the IMDb API has a free version that provides a limit of 1,000 API requests per day. If you need more usage, you can subscribe to the paid pricing plans. Basic – freemium version that allows 1,000 requests per day. Additional requests cost $0.01 per call. Pro – $1/month that guarantees you 100,000 requests per day. Ultra – $5/month for 250,000 requests per day. Mega – $10/month for unlimited requests.